I’m rushing to finish up a numer of things before flying to Spain for a conference. So Facebook chose the wrong possible moment to do what Facebook does best – manipulate data and algorithms without giving a damn about the well-being of a billion users. Except this time it was not done for profit, but for science. Controversy ensued nonetheless. Unfortunately, I don’t have time to write a 5,000 word essay about this. Moreover, as an academic I’m fed up with being an accessory to Big Platform storytelling. So, I point you to a couple of nice articles written by colleagues. They all make really valid points, and you should probably read them if you want to overcome the rhetoric conveyed by the press and the TV, which boils down to saying “you should be outraged because during the last 10 years you’ve been more interested in crap stories about Web celebrities, adorable dogs, and violent teenagers that we’ve been feeding you in our technology columns, and you never took the time to realize that the very mission of a medium like Facebook is to manipulate people’s feelings, opinions, and moods”. So, without further ado, here are the recommended readings. You can use them to outsmart your geeky friends during your Summer outings. Excerpt: “I identify this model of control as a Gramscian model of social control: one in which we are effectively micro-nudged into “desired behavior” as a means of societal control. Seduction, rather than fear and coercion are the currency, and as such, they are a lot more effective. (Yes, short of deep totalitarianism, legitimacy, consent and acquiescence are stronger models of control than fear and torture—there are things you cannot do well in a society defined by fear, and running a nicely-oiled capitalist market economy is one of them). Excerpt: “(…) on the substance of the research, there are still serious questions about the validity of methodological tools used , the interpretation of results, and use of inappropriate constructs. Prestigious and competitive peer-reviewed journals like PNAS are not immune from publishing studies with half-baked analyses. Pre-publication peer review (as this study went through) is important for serving as a check against faulty or improper claims, but post-publication peer review of scrutiny from the scientific community—and ideally replication—is an essential part of scientific research. Publishing in PNAS implies the authors were seeking both a wider audience and a heightened level of scrutiny than publishing this paper in a less prominent outlet. To be clear: this study is not without its flaws, but these debates, in of themselves, should not be taken as evidence that the study is irreconcilably flawed. If the bar for publication is anticipating every potential objection or addressing every methodological limitation, there would be precious little scholarship for us to discuss. Debates about the constructs, methods, results, and interpretations of a study are crucial for synthesizing research across disciplines and increasing the quality of subsequent research. 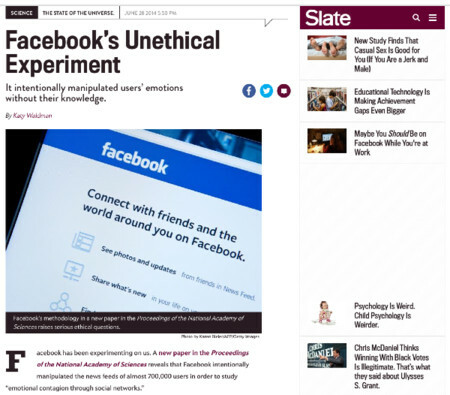 [UPDATE 29.06.2014] Just when folks in the academic community were finally coming back to their senses, the first author of the Facebook study issued an “apology” that will go down in the annals of douchebaggerdom. Having written and designed this experiment myself, I can tell you that our goal was never to upset anyone. I can understand why some people have concerns about it, and my coauthors and I are very sorry for the way the paper described the research and any anxiety it caused.